Pineapples have always been a symbol of Hospitality. Create a warm and inviting welcome to your home with a Pineapple Quilt by using my easy and fast organized techniques. There is no messy paper to tear-away! 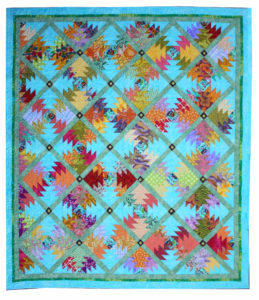 By using a pineapple ruler, or even a square Omni Grid ruler you will be successful in making this quilt. 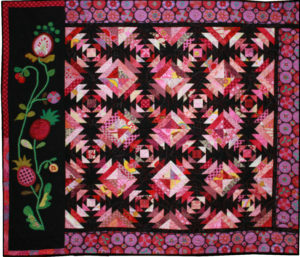 This quilt can be made as large or small as you like, complicated or simple, anyway you like. 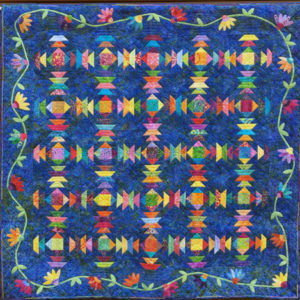 Similar to a log cabin block, it starts with a central square and then grows larger by sewing strips of fabric out from the middle. Don’t want to make a whole quilt? 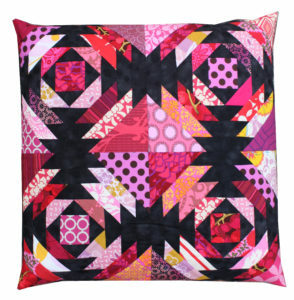 Why not make a 20″ square pillow? I’m always excited when a student finishes their projects and they take the time to send me a copy. Congratulations: Lynn Crawford of Wrightwood, CA. The pineapple quilt is all about precision and for this I prefer to use a ruler designed for making this block. Below are three options, you do not need all three. Please bring one of these to help you make this beautiful quilt.